The Cleveland Cavaliers announced today that they will be wearing a navy blue alternate uniform this year that features wine and gold letters, numbers and trim. According to the team’s website, the uniforms will be worn for the team’s season-opening game on Oct. 30 against New York and will rotate with what the team refers to as its gold uniform (c’mon, it’s really yellow) as the official alternates for the 2014-15 season. “With so much excitement and positive momentum going into this season, this special time called for a brand new uniform to match the energy and mojo of the 2014-15 team,” Tracy Marek, Cavaliers CMO, said on the team’s website. The jersey is OK for what it is, we’ve always liked navy blue as a complimentary color to burgundy, but it’s not as good as it could have been. 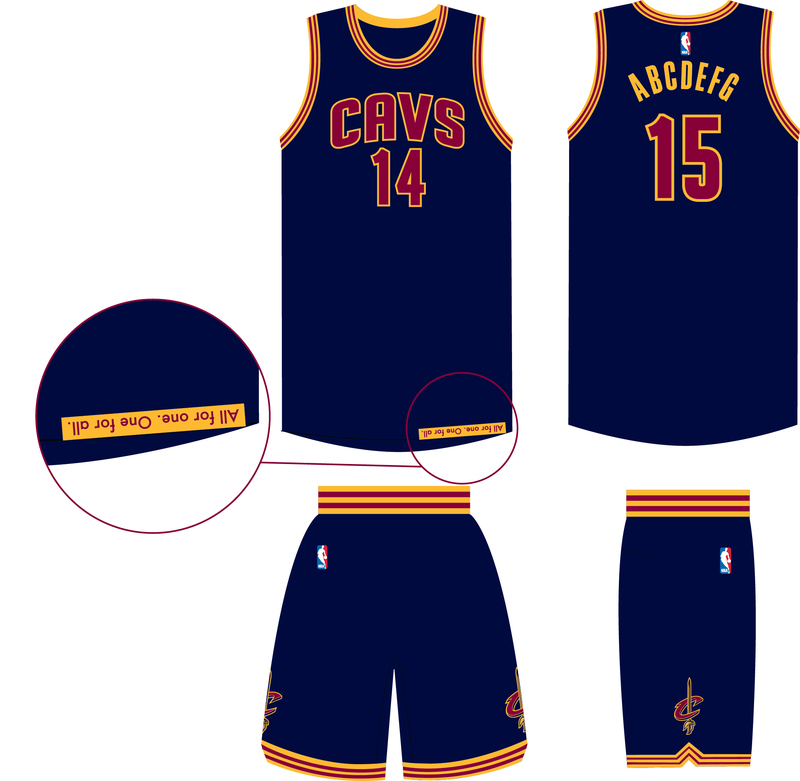 The uniform also features what the Cavs refer to as their “DNA statement” – All For One. One For All. – printed upside down on the jersey’s left hem so it can be an “inspiration” to players. There’s nothing wrong with the phrase, but the rest is just marketing gibberish, especially when you consider that the NBA requires the players to tuck in their jerseys, making the phrase unreadable during a game, ostensibly when a player would need inspiration the most. People fondly remember the Lenny Wilkens-era Cavs because they played a style of basketball that was enjoyable to watch and because they won – not because of their uniforms, which were certainly not “inspiring.” So if the Cavs end up lifting the Larry O’Brien trophy sometime soon, it won’t matter what they’re wearing. Until then, at least every game they wear the navy uniforms is one less game in the yellow ones.